HISD is a Global District in a Global City. That’s why we place an emphasis on ensuring our students become Global Graduates — possessing the characteristics they need to be successful in college and to compete in today’s global workforce. With innovative programs and unprecedented connections to corporate partners and local colleges and universities, HISD teachers are supported every step of the way as they guide our students’ journey from pre-K to Global Graduate. The combination of a great job and a vibrant city means HISD and Houston is the perfect place to start your teaching career. In an increasingly global economy, HISD is providing programs where students graduate fluent in English and a second language. Continue your journey at HISD, where you can further enhance your craft in a district that is committed to developing its teachers. Ready for a new challenge in your career? 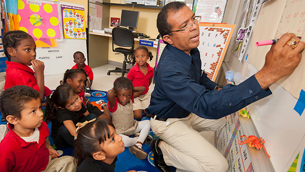 Find out how teaching at HISD is both inspiring and rewarding.